Do you need definitive Supersonic and Hypersonic Missiles market data? Succinct Supersonic and Hypersonic Missiles market analysis? The increase in spending in supersonic and hypersonic missile systems by defence departments has led to publish this timey report. 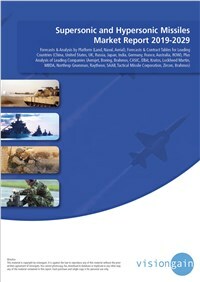 The Supersonic and Hypersonic Missiles market in the defence sector is expected to flourish in the next few years because of increased spending by governments on modernizing their armed forces owing to successful test-launch and deployment of hypersonic missiles by countries such as Russia and China, which has led to efforts to modernize missile systems tailored for the modern armed forces as various stakeholders scramble to meet demands for enhanced air defence. If you want to be part of this growing industry, then read on to discover how you can maximise your investment potential. What does the future hold for the Supersonic and Hypersonic Missile industry? Which company is likely to succeed and why?